A trip to the sand and surf can be a great way to help a senior relax. The sun stimulates the body's production of vitamin D, which is crucial for optimal health and happiness. Bring along beach chairs and umbrellas for shade. Also try not to go at the hottest part of the day as heat stroke and dehydration can put a serious damper on your day. Take plenty of water and hydrating foods like fruit. Help the senior apply 50 SPF sunscreen to prevent sunburn. Don't forget to slather some on yourself too! Take a dip together when you get too hot – the water can be a real lifesaver! Running for the ice cream truck isn't just for kids – seniors love ice cold desserts too! When considering what options to provide an older friend or relative, keep in mind his or her diet. Many seniors have trouble digesting dairy products and may prefer a fruit popsicle over a fro-yo or ice cream cone. Remember that most cones are made with wheat flour and therefore can negatively affect people with celiac disease or gluten intolerance. If you're not sure what treat to bring the senior, ask! He or she will appreciate your thoughtfulness and look forward to indulging! 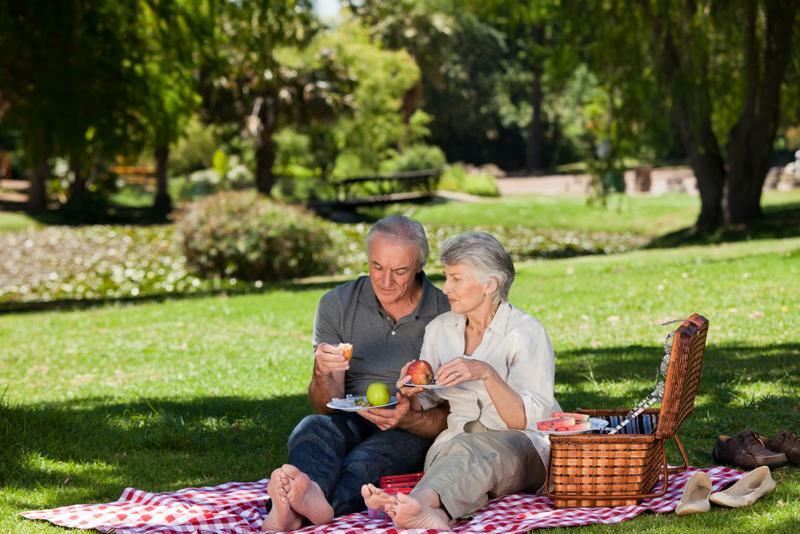 Picnics are a great way to get loved ones together to enjoy summer weather. Some of the best parts of summer can unite in one place: a picnic! Gather your friends and family and have everyone make their favorite warm-weather foods. Then, spread out some blankets and enjoy! Don't forget to delegate what parts of the meal to make, such as salads, sides, main dishes and desserts. And, of course, you'll need lemonade! Consider attendees' diets as well as health conditions like allergies or diabetes to ensure everybody can enjoy your dish or drink. While many people flock to the outdoors when it gets super hot out, that's not always the best idea for seniors. Older people have thinner skin and are more prone to sunburn and other heat-related issues. On a really hot day, ditch your yard work and instead bring your senior loved one to a fun place that offers air conditioning. You can go to the movies to sip on slushies and enjoy a flick in the cool comfort of the theater. Or, head to the bowling alley to don silly shoes and try your best at the lanes. You'll enjoy the break from the hot weather, and your loved one will appreciate having fun in a more comfortable environment than the toasty outdoors. If you're concerned about your senior loved one in the heat, be sure to talk to his or her doctor. The physician can mention ways to ensure the older individual stays cool and healthy all summer.